Yank airman Hugh McQuillen had smashed his way into those history books as “The Iron Ace.” Flying his deadly war plane adorned with the Laughing Skull, he was a grim and unrelenting instrument of war who killed Germans with such ruthless efficiency that he became known on both sides of the line as “The Assassin.” McQuillen believed there was no way to decently bring men to a violent end, so he would not bow to the “chivalry of the air” practiced by his R.F.C. mates and the Germans. This made the Iron Ace many enemies, and they would stop at nothing to bring an end to his savage reign. 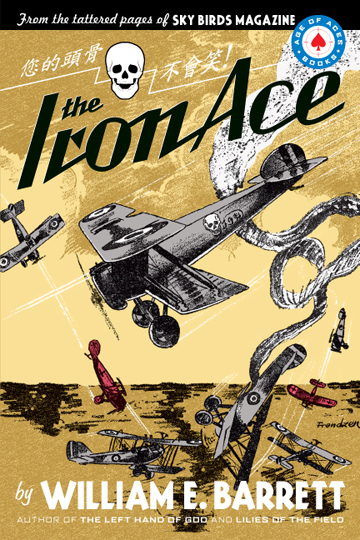 Written by William E. Barrett, the nine tales of “The Iron Ace” appeared in Sky Birds magazine from 1933 through 1934. Barrett is best remembered for his novels, most notable of which are The Left Hand of God and Lillies of the Field.